Graeme Bodel is a rookie rider in the 2013 Scottish minitwins championship. We developed a simple blog design so Graeme could keep his supporters and sponsors up to date, and also to help him attract new sponsors. 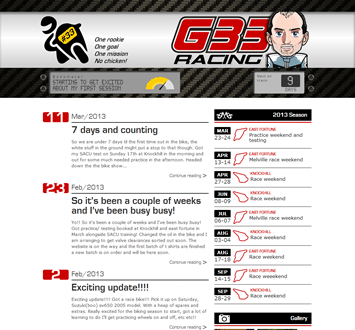 Race weekends are very busy, so it was important Graeme could keep the site up to date with minimal effort. To enable him to do this, we added a a number of small databases to store his races, sponsors, gallery images and status updates. Because we build all our websites and blogs on top of WordPress, it was easy to integrate this functionality into the website and keep it simple to use in the site admin area. Graeme is well known in Scottish motorcycle circles and has been a track day addict for a number of years. When it came to the blog design, it made sense to use a cartoon style avatar to associate the site with him and to make it feel a little more fun. Staying with the lighthearted theme, we also added the “bodometer” on a simulated dashboard. He uses this to publish his latest status updates on the simulated motorcycle dashboard containing an animated gauge. We’ve also recently redeveloped the Citylets blog design, if you are interested in starting your own blog, or have an existing blog that needs a refresh, just get in touch with us and we’ll help you stand out from the crowd with a striking design. 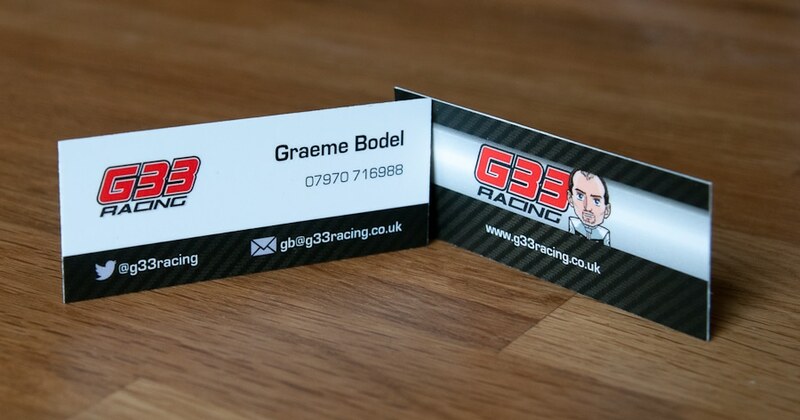 Just for fun we created a minicard – a half size business card – for Graeme based on the look of his blog. The cards are full colour, double sided with a matte finish and just the thing if you are planning on doing a lot of networking and want to be remembered, or have a specific site or product to promote.